Ladies and gents, hang on to yer hats. A very reliable source tells us that the SYM’s Wowow is officially coming to the USA and they’ve provided us images of the forthcoming colors as well as the official name, SYMBA! Get it? SYMba? Tiger cub, how cute is that (and better than Pup or Dash)? It seems that SYM really does listen to their fans. Back in August of 2007 is when the buzz started and today we find out that the SYMBA is expected to begin hitting shops this Spring. We don’t have price or specs right now, but we hope to get the details soon. and the Velodrome which is overflowing with cool resources. I’m excited to see the USA finally getting a new Cub after decades of being left in the cold. SYM built them for Honda for 40 years so I have a feeling they know what they’re doing… and 60 million riders can’t be wrong! Be sure to tell your local dealer to save ya one. Flippin sweet ride! I wonder if I could talk the spousal unit into riding one of those. ZOMG! I cannot wait to jam a 110 kit in there … make it happen faster! Maybe they’ll import a Honda Sonic clone instead of Hi-Bird. Funny thing is when I first got my Suzuki Fa50 shuttle, some people (including scooterists) laughed. Now “moped’s” as they are incorrectly called are the hot thing. I guess it figures when you see the popularity of scooters beginning to reach it’s pinnacle. Anything out of the norm would be cool (or people are just fickle). I’m not knocking this underbone, I like it. But, elsewhere this style has evolved. If anyone wants to import anything “new” then it should look like it and not adhere so dilligently to a dated design. I am leery of clone bikes. I bought a Bajaj Legend, not new but less than a year old, with 400 miles on it. It was beautiful. The geared scooter of my dreams. Everyone said it was just like a Vespa. Bajaj had gotten all the tooling from Italy and made them under contract for a while. The parts may have been interchangeable but the materials were inferior and the assembly was pathetic. The longest it ever ran between repairs was three days and maybe 40 miles. I had it for over a year. I sold this pig cheap, to a guy who loved the art of scooter mechanics and claimed he would have it purring like a kitten. I saw he had it up for sale at a bargain price two months later. I should have destroyed this abomination. You can’t compare it to a cloned Chinese scooter. It is originally a Honda licensed design that’s still being built by an OEM manufacturer (SYM). I’m a bit leery about this. I love the Cub but it seems like SYM is bringing it here without consent from Honda. I think it’s shady when companies like Kymco and SYM copy designs that Honda originally had them build. They may be good scooters but it still seems unethical to copy someone else’s design and make a buck off of it. Maybe? Almost? Hopefully? This’ll teach me for being impatient. Tim….I’m really just a big Honda fan, so I hate to see their legendary products getting ripped off. If the real cub was coming over I’d be stoked. I’m not totally sure what the arrangement is here….so this might be legit. However, it seems that SYM is doing this without Honda’s consent. Regardless of how good this scooter may be, coping designs isn’t cool. Something good to look forward to, and the anticipation may just kill some of us dead. It seems that SYM excels brilliantly where Honda falters repeatedly–i.e. listening carefully to the loyal customers. I hope they sell millions and millions of SYMBA’s everywhere, Wo Wow! Viva Cub! Life is wonderful, ain’t it! I agree with Lorenzo. I’d rather get a good copy than nothing at all. 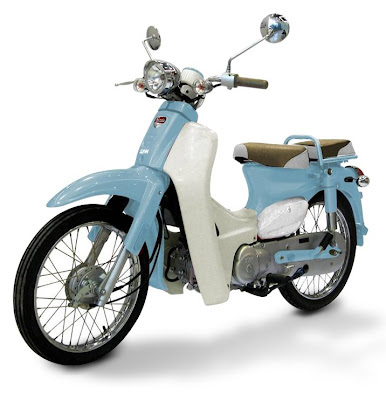 I wanted to buy a Super Cub in 1984, when I entered college but they stopped making them. Twenty six years later and I can finally make that happen. Now I’ll be carrying it on my RV instead of riding it to my classes. Oh, in case you were wondering, I ended up buying a 1984 Puch moped instead. Ah, the memories. this is going to be huge for me. all the mini crotch rocket designs were starting to get me a little weezy toward buying a scooter. Dan, why would you assume that SYM is doing this without Honda’s consent? SYM has been selling this bike overseas for some time now and Honda has not taken them to court, etc. If anything I would assume that SYM has paid for the rights to make the Symba/Cub just as The Genuine Scooter Company bought the rights to the Stella from Piaggio. 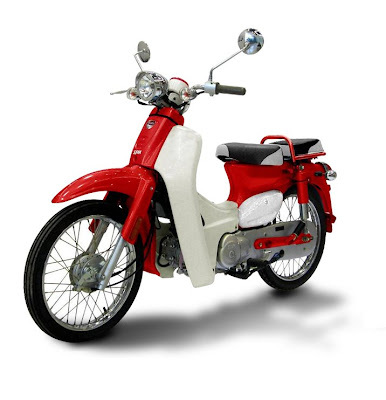 This motorbike with flaring will be a seller I am a fan of small engine bikes, 1. efficiency, 2. maneuverability, 3. simplicity, and 4. just fun. I am a fan of the Honda Trail 110 bike, now there is a chance of a similar bike with front flaring, load them up and go cross country. Just got a note from Scooterstation in Portland saying they’re expecting them in sometime in Spring ’09. As Stephan pointed out, this is not a “clone,” since SYM has been building the bikes for Honda just about forever. And yes, they would have to have Honda’s permission to sell it in the U.S., as this would be part of their OEM agreement. I hate to keep sounding like a downer, but I’m not convinced they have Honda’s permission. Kymco and SYM both used to be affiliated with Honda Taiwan until things got ugly in the early 90′s. My understanding of what happened is that around 1992 Kymco wanted a 150cc version of one of the 50cc scoots. They asked Honda to design one but Honda said no. Kymco decided to impress Honda by shoe-horning in an old 150cc Honda engine (the GY6 I think). They expected Honda to be impressed but Honda was like ‘that’s crap, if you guys want to design bikes using ancient tech, then you’re on your own’. So Honda Taiwan cut ties with Kymco and SYM. Then both of these brands used their knowledge of Honda’s products to sell un-licenced copies in many countries without copyright laws. If you check out Kymco’s world site, you can see they continue to copy many of Honda’s modern scooters but they don’t sell them here. So anyways, SYM, Kymco and Honda had a bit of rough divorce…and given their history of ripping off Honda’s designs since then, I’m not convinced things have been mended. If there any evidence anywhere saying these are licenced? Given the age of the Cub, I wonder if it’s just old enough now that anyone can copy the design. I’m not saying these aren’t great scooters….they’re probably just as good as the legit cubs because they’re made by one of the original cub makers. My worries about this scooter have nothing to do with quality. It’s just that I would hate to support SYM ripping off Honda’s legendary design if that’s the case. Can anyone find some evidence that these are licenced? SYM sells the Wowow in Japan. I have a hard time believing that Honda would let them sell an “unlicensed” knockoff in their own backyard without taking some sort of legal action. Perhaps they do have permission….but copyright laws are quite different in other countries. I believe that illegal copies of DVD’s (Movies, software etc) are sold quite openly in Japan without hassle by the law enforcement so it may be that laws are more lax there. Whoa….is there another Dan on here? That's gonna make things confusing…anyways…. Virtually all chinese 150cc scooters use the GY6. I don't think any Japanese scooters use it anymore. Even the Taiwan makers (Kymco, SYM, PGO etc) have stopped using it because it's so old. However, all of those cheap $700 chinese scooters use the GY6. The GY6 engine is sold all over North America without lawsuits from Honda and it certainly is Honda's design. I doubt all of these Chinese manufacturers got permission from Honda to use this engine in their scoots. It seems more likely that either the tech is old enough that it's okay, or Honda simply doesn't care enough to sue them. It's stuff like this that makes it hard to tell what's legal and what's not. I certainly don't want to support illegal scooters because I want to support the companies that are doing the R&D and bringing us innovation. Companies like Yamaha and Honda are constantly pushing the envelope with technology like liquid cooling, fuel injection and 4-valves in even their 50cc scoots. This is what I want to support. Jon… Get a Life, dude! SYM is the #3 producer in Taiwan and Italy. This is the real deal. Seen it, touched it, etc. Look for it at around $2500+ MSRP. Look for an MSRP around $2600 though. Seen it, been on it. It will require an M endorsement everywhere. And Dan, get-a-life! What you have commented in length about SYM, KYMCO and Honda should have proper references; unless those are all original first-hand sources or considered common knowledge. And ultimately, if Honda ain’t worry about SYM selling SYMBA in US, why should you? Corporate lawyers aren’t called that for nothing. Believe me, yes we know that Honda continues to disappoint us; but hey, it’s not the end of the world. Because for scooterists, SYM delivers. No leading link. No dice. I’m not concerned with whether or not what SYM is doing is technically legal or not. It’s about the spirit of it. What is 100% clear is that SYM is taking one of Honda’s legendary designs and tossing their name on it. Even if it uses mostly the same parts, it’s still not the real deal. Keep in mind, the vast majority of the 118 million Cubs were NOT made by SYM. In the USA, copyrights last for 50 years and 2008 is the 50th year after the Cub debuted. Is this a coincidence? It seems like SYM might just be dodging copyright laws with this copy. I for one am glad it doesn’t have a leading link front suspension. Leading links are great for reducing front end diving, but they are horrible when cornering. As you can see, the press release mentions the 60 million units figure, not 118 million. Nowhere in the press release do they mention 118 million. You can believe who you want, but I am going with honda.com and not wikipedia.org on this one. At a very modest $5 per copy license fee for using their idea, I figure Honda owes Moto Guzzi $300,000,000! The Galletto 175 came out in 1949. 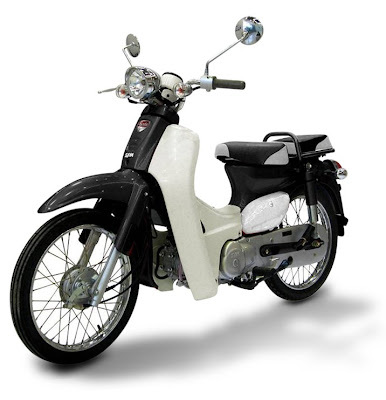 Honda Super Cub came out in 1958. By GEORGE! I think you’re RIGHT! Man… I’d love to have a 175cc Galletto. My socks are rocked by the kickstands ALONE! Where is the SYMBA going to be produced? I still love Honda… but screw them for leaving us without cubs for 25 years! I’m buying a Symba as soon as I can!